The story of Parsifal is part of the medieval legend of King Arthur and the Quest for the Holy Grail. The Grail myth dates back to at least the twelfth century in Europe, and was transmitted in various versions, including French (from the poet Chretien de Troyes), English (Le Morte Darther, by Thomas Malory), German (Wolfram von Eschenbach’s version, which became the basis for Richard Wagner’s “Parsifal” opera) and others. The Grail myth speaks directly to our psyche, and in particular, as the great Jungian analyst Robert A. Johnson notes in his seminal work, “He,” to the development of the psychology of the masculine, in both men and women – and it is as relevant now as it has ever been. The myth surrounds the wounded Fisher King, Amfortas, the king of the Grail castle. He is in agonizing pain, and the kingdom suffers as a result. The Fisher King wound, in psychological terms, is a common condition for Western Man, where every young man, as Johnson notes, “has naively blundered into something that is too big for him. He proceeds halfway through his masculine development and then drops it as being too hot. Often a certain bitterness arises, because, like the Fisher King, he can neither live with the new consciousness he has touched nor can he entirely drop it.” This wound, however, is crucial for the development of consciousness, for its redemption, through the intercession of Parsifal, is what leads to the complete integration of the Self – it is what leads to a life of self awareness, contentment, passion and authenticity. Enter Parsifal, a name which means “pure fool,” an innocent young man raised by his overly-protective mother in poverty, knowing nothing of his dead father (who himself was a knight), without any direction or schooling. He is dazzled one day by the appearance of a group of knights who visit his village and, to his mother’s dismay, decides with all the bluster of youth to seek them out to become a knight himself. She agrees to let him go, but gives him a homespun garment that he elects to wear for much of his life; this garment, Johnson notes, represents the “Mother Complex” in psychology, and will prove costly to Parsifal in his development. Parsifal finds and enters Arthur’s Court but is initially ridiculed and expelled; however, legend held that a damsel in Arthur’s Court who had not smiled for years would burst into laughter at the sight of the greatest knight – which she did at the sight of innocent Parsifal. The Court immediately held Parisfal in high regard and Arthur knighted him on the spot. 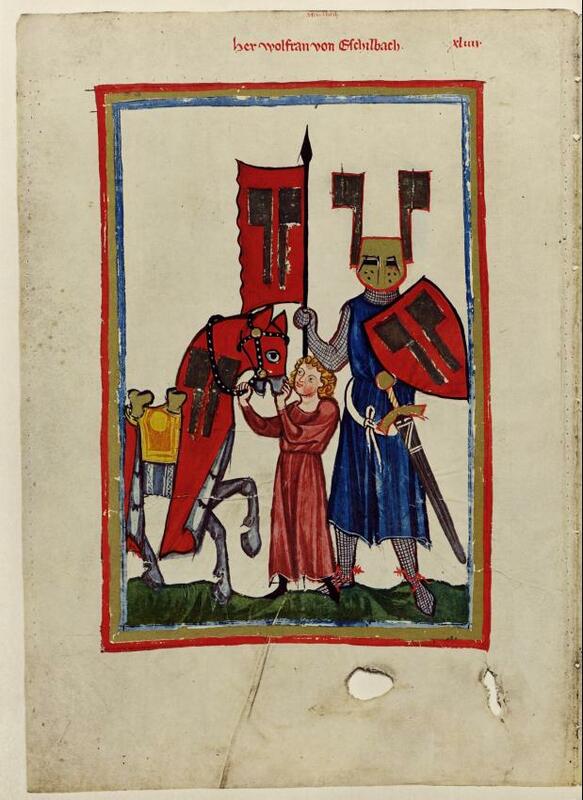 The newly empowered knight goes out seeking battle and adventure, rescuing maidens and defeating opponents, but not killing them; any knight Parsifal overcame he instead instructed to join Arthur’s Court and swear allegiance to him. One day along his heroic quest, Parsifal sought lodging, but was told there was no place to stay for miles. He then encountered a man fishing in a boat on a lake, and asks if he knows of any place to stay for the night. The fisherman, the Fisher King, tells him to go down the road a little bit and go the left. Parsifal obliges and suddenly finds himself on the grounds of the Grail Castle, windows gleaming, knights and ladies greeting him, the splendor of which he had never dreamed of in his life. A great ceremony was about to begin, one which occurred every evening. A great feast and celebration was held where maidens brought out to all assembled the Holy Grail, from which all would partake, immediately granting them whatever they desired – everyone, that is, except for the Fisher King. Because of his agonizing wound, he was unable to drink from the Grail, and his affliction continued to wreak havoc across the kingdom. During his quest, Parsifal had encountered a mentor, Gournamond, who had instructed him in the ways of knighthood. When encountering the Holy Grail, Gournamond instructed Parsifal to ask an important question, “Whom does the Grail serve?” This was the question that would heal the Grail King’s wound. However, his mother had also told him not to ask too many questions and hers was the advice Parsifal heeded this time in the Great Hall. All assembled knew the prophecy that one day an innocent fool would enter the castle and ask the question that would heal the King – all except Parsifal – and very quickly the ceremony ends, with everyone retiring for the night. The next morning, Parsifal rides out and the Grail Castle disappears. This loss tormented Parsifal, and it would take years of grueling, rigorous battles and quests before Parsifal realized that the homespun garment that he wore beneath his armor – the psychological symbol of the Mother Complex – had to be removed before he could partake of the Grail and heal the Fisher King. Parsifal spends some twenty years earning his way back to the Grail Castle. They are difficult years, however, and he grows in bitterness and disillusionment; these represent the difficult years of middle age, where one begins to question one’s very existence and the choices made. After twenty years of searching in vain for what was lost in his first encounter at the Grail Castle, Parsifal has had his arrogance and pride beaten and humbled. One day, along his latest quest, he is introduced to a forest hermit. At first, the hermit scolds him for his failures – especially for not asking the question when he first encountered the Fisher King. However, he soon softens, sympathizing with Parsifal, and then invites him to go down the road a little bit and go to the left . . .
Again, Parsifal suddenly finds himself on the grounds of the Grail Castle, this time, however, with twenty long years of earned experience and humility. Again, he finds himself in the midst of the great feast and celebration where maidens brought out the Holy Grail for all to partake. This time, however, Parsifal asks the question, “Whom does the Grail serve?” The simple act of asking the question immediately heals the Grail King and the entire Castle erupts in celebration! What is the answer to the question? “You, My Lord, the Grail King.” And what exactly does this answer mean? Very simply, we serve something far greater than ourselves. Carl Jung, the great psychologist, would say that by asking this question, one comes to the realization that the Ego now comes into service of the Self. For a beautiful examination of this myth in much greater detail, please see the book “He: Understanding Masculine Psychology” by Robert A. Johnson, from which all quotes above were derived.